In the last “What’s New”, I talked about discovering Screen Drops and excitedly anticipated having wonderful pieces to show you by this summer. Well, we’ve encountered some technical difficulties that we are still working on. 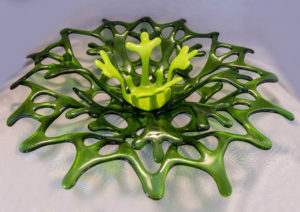 So, instead, I am going to show you some recent work on glass baskets, a new Wave Bowl by Sandy, and tell you about some upcoming art fairs we will be participating in. When we were in Sedona (AZ) a couple of years back, the tile pattern in the shower at our resort had an interesting pattern that looked like a weaving. 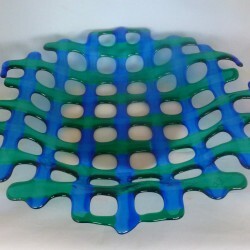 Although the tile was monochromatic and formed a solid structure, I thought I could use two colors of glass to emphasize the weave pattern, and open the weave to make it a basket rather than a solid bowl. The first one I created in transparent blue and green is shown in the first photo. Two recent baskets, one in opaque black and white, the other in transparent red and orange, are shown in the subsequent photos. I call these “Lattice Baskets”. The blue/green basket was cut in a round shape. The other two are square and slumped deeper than the first basket. Such baskets can be created in custom shapes and combination of colors. Another basket variation we worked on is an extension of “Coral Baskets”. Two or three coral baskets of sequential size and slumped in custom formed molds, were epoxied together to form a floral sculpture. 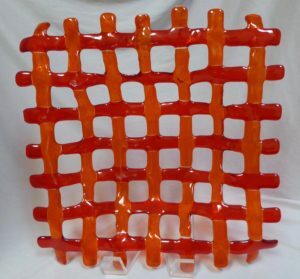 The piece could be used as a centerpiece or provided with a backing for wall hanging. The first photo shows a basket triplet in transparent and opaque spring green. If used as a centerpiece, one could actually put a two inch diameter candle in the center of it for an elegant dinner party. (Kind of over the top if you are looking for a simple candle holder… but impressive!) The second photo shows a sequence of such baskets (triplets and smaller doublets) to form an extended wall display. The color sequence is red, orange, yellow, green, blue, and purple…. the colors of the rainbow. 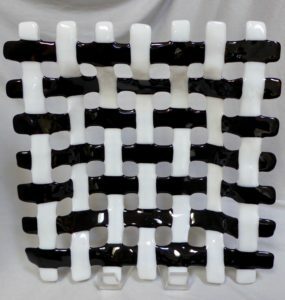 As with lattice baskets, custom versions of the wall display can be created in terms of colors, combinations, and configuration. 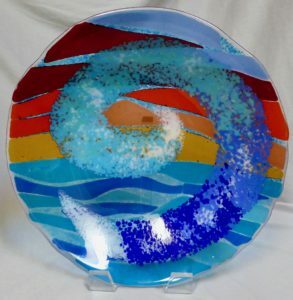 Sandy was recently inspired by a photo taken in Hawaii of a breaking wave tube with a colorful sunset sky in the background. As an abstract representation of this, Sandy created the bowl seen in the photo below. Previous Wave Bowls by Sandy have been on monochromatic blue transparent glass. The setting sun sky colors provide additional interest to the piece. In terms of upcoming events, we have a three day art fair in Sunriver (OR) on August 10,11,12 and a two day art fair in Corvallis (OR) on September 22,23. These are the first fairs that we will be participating in since our move to Oregon. We are looking forward to getting back in the groove and if you are in our area on these dates, please visit the fairs. They provide a wide variety of arts and crafts…paintings, woodwork, sculptures, jewelry, fabrics, ceramics, and of course, glass art. Our booth will have a large “Art to Harmony” banner.